A new study entitled « Discovery of a hypersaline subglacial lake complex beneath Devon Ice Cap, Canadian Arctic » and appearing in the April 11 edition of Science Advances reveals the finding of two subglacial lakes at a high altitude and at a relatively high depth beneath the Devon Ice Cap, one of the largest ice caps in the Canadian Arctic. The two lakes identified by Anja Rutishauser, a PhD student at the University of Alberta, may represent the first isolated hypersaline subglacial lakes in the world. The subsurface bodies of liquid water are hidden beneath 550 to 750 meters of ice at an altitude between 1,200 meters and 1,700 meters above sea level and are located in long basins in a mountain range. The discovery was performed thanks to radar data acquired from radar antennae mounted to the wings of an aircraft, over a four-year period. The radar data had been collected by NASA and the University of Texas Institute for Geophysics (UTIG) with the purpose of analyzing the bedrock conditions beneath the Devon Ice Cap. How can we see beneath the layer of ice ? In fact, ice penetrating radar sounding measurements are performed on the basis of electromagnetic waves that are steered towards the surface, that penetrate through the surface and that are reflected back at contrasts in the underground materials, fundamentally allowing researchers to discern subsurface features through the ice. It was really a surprise to identify pockets of liquid water beneath the ice due to the low level of environmental energy. Anja Rutishauser pointed out : « We weren't looking for subglacial lakes. The ice is frozen to the ground underneath that part of the Devon Ice Cap, so we didn't expect to find liquid water.» She added : « We saw these radar signatures telling us there's water, but we thought it was impossible that there could be liquid water underneath this ice, where it is below -10C.» Water can remain liquid below 0 degree Celsius if the liquid is salty like in our seas or oceans. That's why the subsurface lakes are likely salty but that's not always the case. Some subsurface lakes can exist thanks to hot springs or geothermal activity. Until now, more than 400 subglacial lakes have been found or identified worldwide. They appear to be mostly concentrated in Antarctica. A few subglacial lakes have been identified in Greenland as well. The two lakes identified beneath the Devon Ice Cap turn out to be the first subglacial lakes found in the Canadian Arctic. Those subsurface lakes may have the particularity of being particularly salty. In other words, they may be composed of hypersaline water. According to Anja Rutishauser, the high level of salinity in those subglacial lakes may be closely linked to the presence of salt-bearing geologic outcrops beneath the ice. The other subglacial lakes which have already been identified or discovered in our world are thought to contain freshwater. Anja Rutishauser worked in partnership with her PhD supervisor from the University of Alberta, the glaciologist Martin Sharp and the geophysicist from the University of Texas Don Blankenship as well as other researchers from the University of Texas at Austin, Montana State University, Stanford University, and the Scott Polar Research Institute in order to test her hypothesis regarding the nature or the characteristics of the subglacial bodies of liquid. The subsurface pools of liquid water hidden at a high depth, at a high altitude and at a high latitude appear to have a surface area of roughly eight and five square kilometers, respectively. They evolve in an environment where the ambient temperature is below freezing that is to say below zero degree Celsius. The hidden bodies of liquid water appear isolated, without any connection to the sea or without any connection to any marine water sources or surface meltwater inputs. The subglacial lakes may remain liquid due to a high level of salinity despite the extremely low environmental temperatures. In fact, the subsurface pools may be rather hypersaline containing a concentration of salt four to five times higher than that of seawater. The composition, the pressure and the temperature of the liquid play a key role regarding the state of the material. Water can't appear in its liquid form if there is no pressure above it. On the Moon, for instance, water can't remain liquid on the surface. Liquid water can be potentially present inside the Moon beneath its grey crust if there is the right combination of environmental temperature and pressure. One can also imagine the presence of liquid water beneath the icy surface of Europa or Enceladus or beneath the intriguing surface of Saturn's largest moon Titan. The internal dynamics of Titan and Europa is a big question mark. The two subglacial bodies of liquid water recently identified by Anja Rutishauser may host microbial life despite the extreme conditions that we can imagine. What kind of ecosystem can we find there ? The presumed creatures thriving in that environment can't benefit from solar radiation and can't use photosynthesis. Are there hot springs which bring enough energy to allow the development of an ecosystem ? One can imagine the presence of extremophiles which can withstand the extremely high pressures and the relatively low environmental temperatures. The study of that kind of ecosystem may allow us to better anticipate the type of ecosystem or the type of microbial life that we may find elsewhere in the Solar System, beneath the icy crust of some worlds like Europa, Ganymede, Titan, Enceladus, Triton, Pluto or Charon. All the subsurface or subglacial lakes found on Earth represent natural laboratories for the study of life in the absence of sunlight. However, the environmental conditions can significantly vary from one subsurface pool of liquid water to the other subsurface pool of liquid water. If the subsurface lakes are connected to the sea or the ocean, they will tend to be saltier. The composition of the liquid is likely to have significant implications for the development of an ecosystem. The subsurface lakes identified beneath the Devon Ice Cap are particularly salty and their composition may be close to what we are likely to find beneath the crust of the ice-covered moons or worlds in our Solar System. Regarding the two hidden lakes found in the Canadian Arctic, Anja Rutishauser pointed out : « We think they can serve as a good analogue for Europa, one of Jupiter's icy moons, which has similar conditions of salty liquid water underneath –and maybe within– an ice shell. » The two subglacial bodies of liquid water may have been isolated for a very long time, allowing the development of an exotic ecosystem, in the absence of any interaction with the atmosphere, the sea or the ocean. Anja Rutishauser advanced : « If there is microbial life in these lakes, it has likely been under the ice for at least 120,000 years, so it likely evolved in isolation. If we can collect a sample of the water, we may determine whether microbial life exists, how it evolved, and how it continues to live in this cold environment with no connection to the atmosphere. » Obviously, that's always a feat to collect a sample of a subglacial lake located at a depth exceeding 500 meters ! The radar data obtained from the wings of an aircraft demonstrate that we can potentially discover pools of liquids beneath the surface or the icy crust of other worlds, without any drilling process performed by any lander, rover or drone. We have clearly identified geysers located in the fractures of the south polar region of Enceladus, the tiny moon of Saturn. So, we know that there are probably seas or pockets of liquid water beneath the icy crust of Enceladus. A lot of moons like Titan or Europa may possess a liquid layer beneath their crust. The two subsurface lakes hidden beneath the Devon Ice Cap interact with salty rock outcrops. Anja Rutishauser, who will end her PhD with Martin Sharp at the University of Alberta this summer and who will then begin a postdoctoral fellowship in the fall at the University of Texas at Austin, is convinced that we may find similar salty rock outcrops beneath other ice caps in the Canadian Arctic. « Although the Devon hypersaline subglacial lakes are very unique discoveries, we may find networks of brine-rich subglacial water systems elsewhere in the Canadian Arctic. » Many subglacial lakes on Earth captivate our imagination because they are isolated. Lake Vostok, located at a high depth beneath the blanket of ice of Antarctica, is clearly one of those mysterious lakes. Anja Rutishauser and her team are now collaborating with The W. Garfield Weston Foundation to perform a more detailed geophysical survey from the air over the Devon Ice Cap this spring in order to gather more information about the subglacial lakes and their geological and hydrological configuration. For three generations, The W. Garfield Weston Foundation has performed its mission to improve or enrich the lives of Canadians. With a particular attention on medical research, the environment, and education, the Foundation takes action to catalyze inquiry and innovation to generate long-term change. As the Foundation marks its 60th anniversary, it goes on collaborating with a large number of Canadian charities to further world-class research, to study or develop new ideas and to produce strong benefits for the communities in which it works. The study regarding the two subglacial lakes was supported by funds from the Natural Sciences and Engineering Research Council of Canada, Alberta Innovates Technology Futures, the CRYSYS Program (Environment Canada), the G. Unger Vetlesen Foundation, the Fulbright Scholar Program, NASA, the U.S. National Science Foundation, and the UK Natural Environment Research Council. The study of our subglacial lakes draws the whole attention of exobiologists who try to imagine the type of biochemistry we may find beneath the hypothetical subsurface lakes, seas or oceans located inside Europa, Enceladus, Titan or even Pluto. 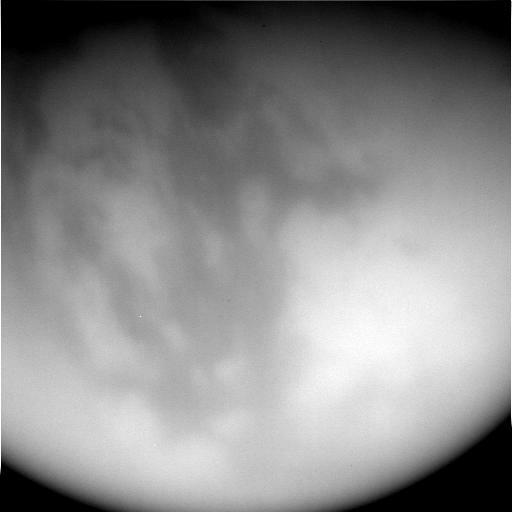 The raw image appearing in the upper part of this table reveals a portion of Titan's surface. The black-and-white view whose file name is W00039716.jpg was obtained on December 5, 2007 from the Cassini orbiter using the IR2 and IR1 filters. The view had not been validated or calibrated and a validated/calibrated view was going to be archived with the Planetary Data System of NASA. The image found in the lower part of the table represents the same view with an artificial color. The surface of Titan can be identified in the infrared or near-infrared spectrum. Are there pockets or seas of liquid water beneath the bright areas observed in that view ? Credit for the raw image: NASA/JPL-Caltech/Space Science Institute. Credit for the incorporation of the artificial color into the original image: Marc Lafferre, 2018. To get further information on that news, go to: https://www.ualberta.ca/science/science-news/2018/april/subglacial-lakes-in-canadian-arctic and http://www.bbc.com/news/science-environment-43701375.